Although there’s no shortage of historic sites in Taos, the highlight of any visit is a stop at the extremely well preserved Taos Pueblo (www.taospueblo.com). This historic Native American community, which is located at the base of the Sangre de Cristo Mountains, dates back over 1,000 years. The adobe homes are passed down from generation to generation and they are still used for cultural and religious activities. Today approximately 150 people live in the pueblo full time, while others use their family homes to sell hand-crafted wares or native food. There is accessible parking in a dirt lot near the registration building, with level access over to the site. Accessible restrooms are located behind the registration building, and although the modern stalls are accessible, the cement ramp up to the building is a bit on the steep side. Still, with a little assistance it’s doable, There are also porta-potties located throughout the pueblo, but none of them are accessible. The dirt pathways through the pueblo are level, and although there are a few bumps along the way, it’s pretty easy to navigate around the obstacles. You can wander through the pueblo on your own, or join one of the walking tours conducted by tribal members. If you go it on your own, remember that this is a living community, so be careful not to wander into any restricted areas. Be sure and stop at the St. Jerome chapel, which features level access at the front door. Built in 1850, the sanctuary houses a Virgin Mary statue that was brought over by Spanish missionaries. 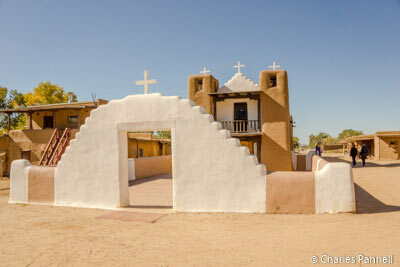 Other sites worth a visit are the San Geronimo church ruins and graveyard, the north and south houses and the plaza. There’s no shortage of vendors inside the pueblo, and although some of the adobe houses are a tight fit, many are accessible to wheelchair-users and slow walkers. Don’t miss the drying racks with corn husks, fruit and meat in the plaza, and the large bee hive adobe ovens used to bake bread, pies and meats located nearby. There are a few benches to sit and rest along the perimeter, and you can do the self-guided walking tour at your own pace. And although not all of the inside areas are accessible, the best views of the pueblo can be had from the outside. It’s an interesting look at a unique culture, and as an added bonus many of the residents are eager to share their tribal history with visitors. In short, this site is a must-see on any Taos itinerary.